Monday, July 25: Having watched the Democratic National Convention today and enjoyed the many well-meaning speeches, including those of Michele Obama and Elizabeth Warren, I couldn’t be more pleased than with Bernie Sanders’ speech. It was the last speech of the day, yet still filled with the vim and vigor of the morn that only the Truth can bring. Through it all, Sen. Sanders has managed to stay truthful, on message, and finally give a robust endorsement of his former rival as well. Thus, Bernie Sanders is truly a man of good character and a great politician, in my opinion. After watching his interview with Chuck Todd shown Sunday on Meet the Press, that I had recorded, I had to admit that Bernie had shown me why I should vote for Hillary Clinton who’s poised to be the Democratic nominee. Despite my misgivings about Hillary’s willingness to actually promote the progressive Democratic Platform that Bernie and Company had worked so hard to get after the primaries ended, I now understand and see some good reasons why voting for the Democratic nominee would be better for our country, given the GOP’s agenda. Though some in the media, but not all, tend to mock Bernie’s concept of a political revolution during the primaries, and afterwards, I and the rest of Bernie’s supporters understood immediately, particularly after hearing Bernie speak. Seems, Bernie Sanders’ dream of a political revolution is not so farfetched after all. Since this is what we all should be doing whenever our society loses it way and corrupts our government. Perhaps in advising us to ask what we can do for our country, President Kennedy basically said the same thing some fifty-five years ago, during his inauguration address, when he reminded all Americans of our responsibility as citizens of a free democratic society to take an active part in our government. Thus, as American citizens, we must also do our part to keep our government free of corruption in all its varied forms. So we can truly enjoy “the blessings of liberty” for ourselves and our children, as stated in the Preamble of our U.S. Constitution. 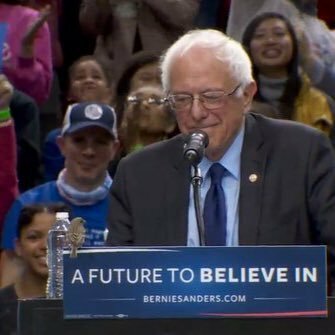 As Bernie spoke, the camera scanned the audience that was filled to capacity according to reports. Many were crying, likely for the loss of a great leader, or so I felt. Sadly, way too many voters missed the important messages that Bernie brought to the primaries. Sadder still, is the sorry apology the DNC announced Monday for interfering with the election process. Now, too little, too late, this apology means nothing as the damage has already been done! Moreover, the apology was only made after the “Emails From the DNC WikiLeaks Dump” exposed the DNC’s intent to undermine Bernie’s credibility. Though his credibility is still intact, the real tragedy is that all Americans have been deprived of a noble leader in the likes of Bernie Sanders, particularly when needed the most. Perhaps behind all of our tears as Bernie graciously exits the campaign trail, is the heartbreaking fact of knowing what might have been. For rarely does such nobility appear among us and ready to serve. The good news is, many more Americans are awake now, thanks to Bernie Sanders’ good works on the campaign trail. Who knows what the morrow will bring. After all, tomorrow is another day (to paraphrase Scarlet O’Hara, our protagonist in Gone with the Wind)! Meanwhile, we’ve placed the future in the Hands of God. Keep the faith. And may God bless us all!